Register Now! This very popular course sells out quickly. A must-attend for law enforcement officers, regulatory investigators, Crown Attorneys, Defence Lawyers, Judges. Search Warrants are powerful tools that can make or break your case. Recent decisions make apparent the importance of clear, accurate and complete Search Warrant Applications and the dire consequences of deficient drafting. Don’t miss this opportunity to get the knowledge and skills you need to draft a wide variety of search warrants with clarity and certainty, to review and revise them, and to identify and develop strategies for defending and attacking the warrant in court. For boardroom and multi-purchase rates, please email us. After your purchase is complete, the course will appear in the Order History of your OsgoodePD account with a link to "Take Online Course". Once you click "Take Online Course" you will be forwarded to the Moodle page with the materials link. The program video link with be unlocked on the day of the program. You will have access to the video for 90 days. We will make every effort to present the program as advertised, but it may be necessary to change the dates, location, speakers or content with little or no notice. In the event of program cancellation, York University and Osgoode Hall Law School’s liability is limited to reimbursement of paid fees. 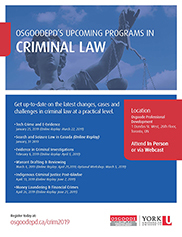 Our Criminal Law programs are developed and delivered by some of Canada’s foremost criminal law experts. Learn more.